With the proper instructions and the right tools for the job, you can learn how to lay pavers and create a unique outdoor space, like a walkway or patio. Pavers, which are available in a variety of materials and colors, can help add charm and personality to a landscape. Pavers come in all shapes and sizes so you will need to plan and design your layout before you get down and dirty. On a sheet of paper, design your project to scale. Be sure to note any differences in elevation. To calculate how many pavers are needed for your project, measure the square footage. The amount of pavers needed depends on the size of your pavers in relation to your project. Experts recommend adding an extra 5 percent for areas that are square or rectangle. If your area has rounded corners or an odd shape, you should add 10 percent to the actual square footage. The extra pavers can then be cut and used to achieve your design. To mark the area that you want to pave, drive stakes to into the corners of the perimeter. You can use twine or cord to outline the area that will be paved by attaching the string to the stakes, framing the perimeter. If you want to keep it simple and you only have a small area to pave, you can even use a garden hose. Before you lay pavers, you will need to remove the grass, topsoil and level the ground. If you are working on uneven land, you will need to excavate before beginning your project. Do not let the world 'excavate' frighten you, it can be done by hand if your paving project is small. Simply remove the soil from the higher end of the area with a shovel until the area to be paved is level. If your do-it-yourself project requires removing an already existing hard surface (like a driveway or concrete walkway), you may want to hire a contractor. You can also rent mechanical excavating equipment. Whether you decide to use hand tools or professional equipment, the land should be excavated enough to accommodate for the height of the pavers as well as the base material. After the ground is prepared, lay down a base material like gravel. Your uncompacted base layer should be less than 3 inch thick. Once you have covered the foundation, rake the base material into place and wet it slightly. Now you are ready to compact the surface. This can be done with a mechanical plate compactor. Some opt to compact the ground with manual tools but renting a mechanical compactor for paving will save you a lot of time and energy. Experts recommend a 4 inch base layer for pavers. Next you will need to cover the compacted layer with bedding sand. Using edge restraints in your paver project can help keep your pavers in place and guard against wear and tear on the base. Edge restraints should be set into the ground, around the perimeter of the area to be paved. These can be fashioned from concrete, wood or extra paver tiles. Before laying pavers you will need to level the sand that the pavers will be set into. Screeding is a technique that uses rails, made from PVC or wood, to help compact and perfectly level the sand. After placing two screeding rails parallel to each other into the bed of sand, drag a board across the top, applying pressure, to flatten out and set the sand in place. Remove the rails and fill with the empty rail beds with more bedding sand. When the foundation work is complete, you can begin laying the pavers into place. Choose a corner of the area you want to pave and work your way in the opposite direction. How to lay pavers in a pattern depends on the look you are trying to achieve. 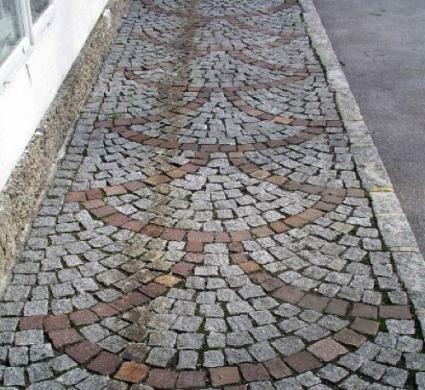 Common paver patterns include basket weaves and herringbone designs, although some opt to create a random pattern. Spread a layer of grouting sand over the pavers after they have been set in place. Using a broom, sweep the sand so that it falls into the grooves and joints between the pavers. After all the cracks are filled, use the compactor to compress the pavers and sand. Depending on the paver material used, sealing the pavers is an optional step. If you learn how to lay pavers correctly you will have a patio or walkway that will stand the test of time. While it may take a bit of elbow grease, it's well worth the time invested.